The Amazon EC2 services allow you to run virtual machines in the cloud by creating machine images and then starting instances of those images. 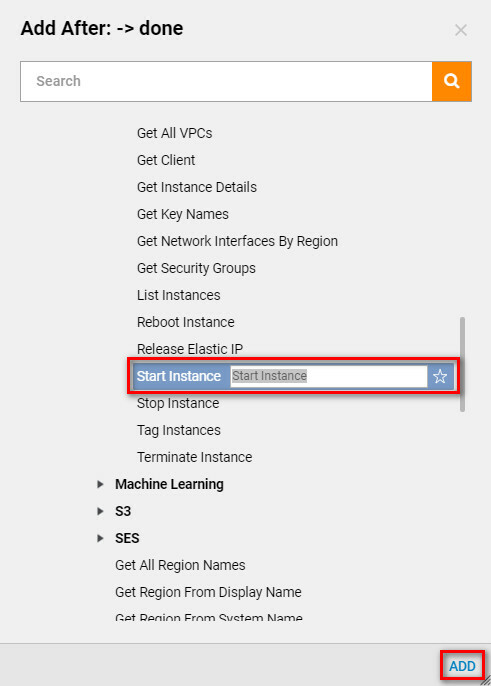 These EC2 machine instances can be started using the Start Instance	step. Before using this step you must create an image of a machine in your EC2 console. To start an EC2 machine in your Amazon account, first set up your Amazon WebServices Settings in the portal. Next, in the Flow Designer , drag a Start Instance	step to your workspace from the Integration > All Integrations> Amazon EC2	category in the Components	panel. Begin by dragging the Start Instance	step onto your workspace and connect to the Start	and End	steps. Click on the Start Instance	step to configure the inputs and outputs. Each of the inputs are values that come from the properties of the EC2 image you want to start or from your EC2 account. The output value is a string which will contain the instance if of the instance this step starts. Run the flow and check your EC2 console to see that the instance has been started.